Full disclosure: The author of this book is a long-time friend of mine. In fact, this past week I was writing my Project 52 post about the year I was 20, and the post included several pictures of Gina at Disneyland. We had invented the S.I.K. Club — a group that wasn’t afraid to be silly and whose theme was Joy. And a couple days after posting that, something Gina said in this very book blessed me. 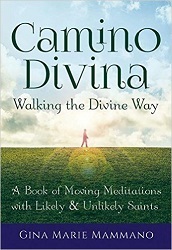 What is camino divina? Well, since camino simply means “road” and divina means “divine,” the pair of them together could be thought of as “the path of the Divine” or “the divine way.” It’s a merging of the Spanish camino and the Latin divina, a lingua marriage of sorts. In my vernacular, it just means taking a meaningful stroll out in nature, on a labyrinth, under the moon, with divine words laced in rhythm along with it. She’s talking about taking a phrase with you and mulling it over as you walk. 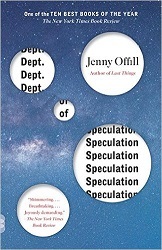 This book is designed to take you on a journey — no, many journeys — of both outer landscape and inner landscape. The outer landscapes are all around you and can be explored through a well-planned or serendipitous trip, a pilgrimage to a sacred site, or a meandering somewhere in your own neighborhood. The pith, though, is found in the inner landscape. That is something you take with you wherever you go. It is your inner self, the very soul-housed uniqueness of time and space that you bring into the world and bring into your life’s experiences. I’ve created twelve adventures that give you the chance to traipse into both of these realms — the inner landscape and the outer landscape. On each adventure I’ve paired you up with a spiritual guide whom I call a “saint” — a sage who has spoken inspiring words and ideas into my soul and out into the world. I’ve then chosen a theme that highlights one aspect of the featured sage’s wisdom and legacy, but by no means encompasses it. As you wander into themes like Amazement, Wildness, Darkness, the Liminal, the Surprising, or the Familiar, know that they can be explored not only with the saint associated with that particular theme, but with the others as well, serving as launching points for you to explore many other possibilities in your camino divina practice. When you’ve finished this book, I encourage you to create a list of your own “saints,” those whose words and thoughts have inspired — and continue to inspire — you. Gina’s writing is beautiful — She’s a poet — and she opens windows into the words of these twelve writer-saints she’s chosen. I’ve been walking with these meditations for months now, and they’ve opened my eyes. 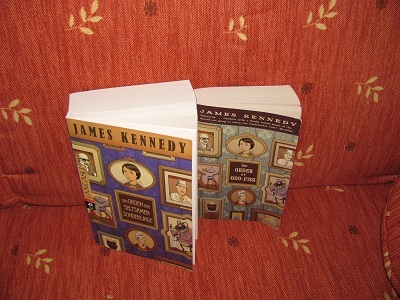 And I know if I make the journey again through this book, I’m going to uncover all new riches. 17-year-old Yuri Strelnikov, PhD, has been sent from Moscow to help NASA. An asteroid is headed for earth and is going to explode above Los Angeles and destroy the entire region. Unless they can figure out how to stop it. Yuri has done work with antimatter for which he hopes to win the Nobel Prize. If he survives the asteroid. There are many factors in play. The scientists at NASA have trouble respecting a teenager. Nor do they want someone from Moscow to know what weapons are available to use against the asteroid. Never mind that this information would help with the calculations. But Yuri learns they don’t intend to let him go back home. If they survive. Meanwhile, Yuri meets a girl, a janitor’s daughter. She is interested in showing Yuri what it’s like for a normal teenager in America. 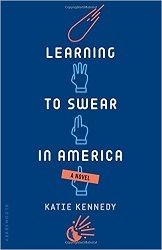 She gets him to come to high school with her to deal with her sadistic algebra teacher. He even offers to take her to prom – during which there’s a message that news about the asteroid has taken a dramatic turn for the worse. I like the scene where Dovie and her brother Lennon take Yuri to a mall. This story is full of charm. Yuri’s just a kid who’s trying to save the world. Oh, and win a Nobel Prize. Castle Cranshaw, who’s giving himself the nickname Ghost, learned to run the night his dad shot at Ghost and his Ma. So when I was done sitting at the bus stop in front of the gym, and came across all those kids on the track at the park, practicing, I had to go see what was going on, because running ain’t nothing I ever had to practice. It’s just something I knew how to do. It turns out that Ghost is as fast as the fastest kid on the team — so the coach lets him join. But Ghost’s Ma will only let him stay on the team if he can stay out of trouble. And then all the other kids have nice shoes. How can he ask his Ma to pay for shoes like that? This story is simple — a kid’s life is transformed by becoming part of a team — but it’s carried out well. There’s nothing stereotypical about the story, even if you can sum it up in a stereotypical way. 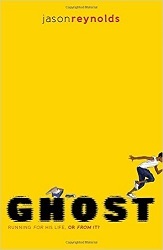 The details of Ghost’s life — the particular ways he gets bullied, his particular temptations that get him in trouble, the particular kids he gets to know on the track team, the particular coach with a bald head and missing tooth who drives a taxi — all those particulars make this story come to life and feel like something we haven’t heard before. I cringed when I saw “Track: Book 1” on the title page, because the last two books I read were also Book One. But this book is complete in itself — Okay, they don’t tell you who wins the race at the end, which is slightly annoying, but the story is complete and gets us to Ghost’s first race. All the same, I’m glad I’ll get to find out what happens next for Ghost and his new family on the track team. You are currently browsing the Sonderbooks blog archives for November, 2016.